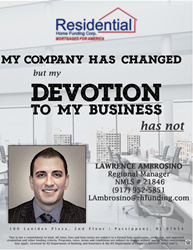 Residential Home Funding is proud to announce the addition of Larry Ambrosino to its Consumer Direct Division. Ambrosino brings more than 12 years of experience in mortgage banking to the table. Residential Home Funding today announced the addition of Larry Ambrosino to its team as Regional Manager for the company’s Consumer Direct Division. Larry brings more than 12 years of experience working within the mortgage banking industry as a Sales Manager for Freedom Mortgage. His addition to the team at Residential Home Funding will not only aid in the company’s expansion, but will also promote the highest level of customer service and leadership within the mortgage banking industry for which the company is known. Residential Home Funding Corp. strives to be the lender of choice for customers by providing both diversified and competitive mortgage financing options with excellent customer service. Established in 2000, Residential Home Funding Corp. is a correspondent mortgage banker based in New Jersey. We are direct lenders licensed in CT, DC, DE, FL, GA, MD, NC, NJ, NY, PA, SC, and VA. As of 2015, Residential Home Funding Corp. has a staff of more than several hundred employees. It’s those employees that help make Residential Home Funding Corp. a national force in mortgage banking. With a diverse customer base that includes first time home buyers as well as high net worth individuals, Residential Home Funding Corp. can provide the appropriate financing to meet any customer’s specific needs. Our experience enables us to fund all types of transactions such as basic residential purchases, refinances, investment properties, construction loans, mixed use, and more.